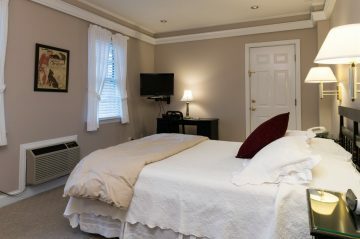 Rooms on the ground level of the Stanton House Inn are some of the most popular in our Greenwich boutique hotel. Some of the most popular rooms include: Room 10, Room 12, and Room 16. All our rooms feature the best amenities to make your stay here perfect. View all our ground level accommodations and select your favorite from the list below. A romantic poolside room off of the main patio on the south side of the house, Room 14 has a queen-size forged canopy bed and antique Victorian furnishings. 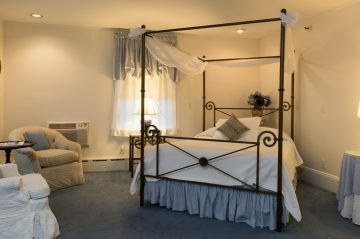 Located on the first floor, with working gas fireplace and private outside entrance, it has a full bathroom with tub and shower. 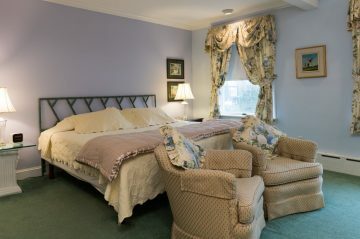 This is a room on the first floor with a king-size bed, small sitting area and refrigerator. The original porte-cochère of the house, Room 10 has a full bathroom with tub and shower. This is a quiet first floor room at the back of the Inn. 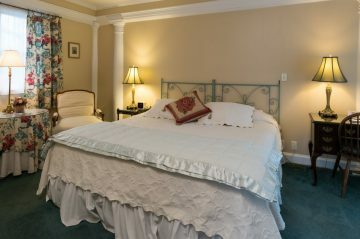 It features a queen-size bed with Duxiana mattress. Room 16 has a full divided bathroom with tub/shower, separate water-closet, and an additional outside entrance. 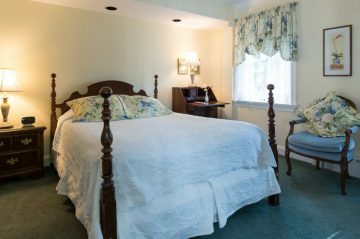 Conveniently located on the first floor, this room features a queen-size bed, a superior Swedish mattress from Duxiana, full bathroom with tub and shower, and an additional outside entrance.